The Grand Leve’s Göran Hjertstedt was my very special guest on Pure Pop Radio: In Conversation on May 30. This show was, in fact, the second of two, back-to-back episodes broadcast that evening. Göran, formerly of Pure Pop Radio favorite band Longplayer and now the creative force behind the Grand Leve, has produced yet another marvelous mix of melodic pop and roll, performed by Göran, Ulf Holmberg (ex-Longplayer), and Ian Haugland, the drummer for Swedish rockers Europe. Grand melodies abound in this new collection, a must for fans of melodic pop music. Göran and I talked about the Grand Leve, and surveyed his musical journey from his time in the hit pop band Visitors to his work with Ian in Brains Beat Beauty and his time with Ulf in Longplayer and, subsequently, the Longplayer Orchestra. You can, and should, purchase the Grand Leve’s debut album at Amazon. Looking for New Music Adds? Why, We’ve Got Some! Things are hopping here at the spacious, newly-fake-wooded-floored Pure Pop Radio headquarters, and by hopping we mean we’re having to hop over things that are in the way, that have been put there by the team of flooring professionals that just installed a new not-carpet surface to walk on. Well, that was something to live through for two days this past weekend, and then there’s the cleanup! Whoa! And through the events of the past few days, which are hitting up against the start of television and radio broadcasts of Washington Nationals spring training baseball games–spring is springing, for sure–we’ve been listening to and adding to and reveling in a whole lot of new music that has been added to the ever-growing Pure Pop Radio playlist. The Foreign Films | The Record Collector (Side Four) It occurs to us that there must be as many style paths floating around in Bill Majoros’ brain as there are Real Facts printed underneath Snapple bottle caps, and the evidence, it seems, is clear on the fourth side of the master’s upcoming double-record set. Bill has been releasing this album one side at a time; this time around, the songs are perhaps a bit more soulful and fit together like a tightly-knit glove. Here’s the rundown on the latest six songs from the Films, all of which are now spinning in rotation: “Aloha Blue Sky,” a tempting slice of Philly soul buoyed by rock ‘n’ roll spirit; “Falling Like a Star,” a John Lennon-esque number with an air of mystery; “Time Disappears (La Lune de L’amour),” a gospelized ballad; “Dream Another Dream,” another Lennon nod, this time in ’50s “Starting Over” mode; “Sunset by the Sea,” a breezy ballad dressed in Steely Dan comfort clothes by way of “Rikki Don’t Lose that Number” and Van Dyke Parks-ish marimba and steel drums accents; and “Letter to Our Future Selves,” a winning pop song by way of Jim Croce and Paul McCartney (surely the inspiring duo of the year so far), with a touch of Pure Pop Radio favorites Muller and Patton thrown in for good measure (Bill, meet Muller and Patton). If the Foreign Films’ The Record Collector doesn’t wind up in voluminous top 10 lists this year, we’ll eat the hat we don’t wear. Seriously…this is great. The Longplayer Orchestra | “All in the City” It’s been six years since we came across one of the most refreshing, exciting and, most of all, fun albums we’d heard in ages–the debut long player by Longplayer, subsequently to be called The Longplayer Orchestra. Comprising Goran Hjertstedt, Ulf Holmberg, and Ian Haugland, who was Goran’s partner in the glorious Brains Beat Beauty, the LPO has released the first track off the forthcoming album, Memory Lane, and it’s the usual LPO fare: fun, lively, tuneful, hooky and just vaguely ELO-ish (well, maybe more than vaguely). LPO’s music gives us great pleasure; we can’t wait for the full album. Great, great, great. The Del Zorros | “Step Away from My Heart,””Hold You All Night Long (Dream Little Dreamer),””The Henrietta,” and “Downton Abbey (Let’s Go)” “Come on down to the shining river; it goes on and on and winds forever,” Lance and Leigh Bowser (aka Monty and Stede Del Zorro) sing rather romantically in the lovely, satiny “The Henrietta,” a song from last fall’s glorious Del Zorros long player, Wilmington, now a single release that just gets under your skin like the best things you love. And speaking of love, “Hold You All Night Long (Dream Little Dreamer)” is a song that you will, you know, love–a soulful strutter of epic proportions, if epic, in this case, is the feeling you get dancing with the one you love, ever so close. “Step Away from My Heart” is a Staxian stomper, perfect for the dance floor, and “Downton Abbey (Let’s Go)” is a timely sendoff for the popular PBS program that just concluded its loving run. Monty and Stede are doing great work, and we’re proud to be featuring it on Pure Pop Radio. James Patrick | “Pet Your Stereo” and “Rabbit Hole Blues” Look no further than the short and sweet power-packed nugget “Pet Your Stereo” that’s shooting straight out of the glam-pop well for your Marc Bolan-y fix. From James Patrick’s upcoming album (think April), this is a sizzler–a groovy contemporary stomper oozing replayability for maximum enjoyment. And, as good as “Pet Your Stereo” is, “Rabbit Hole Blues” might just be even better. A Todd Rundgren-esque song with just as much Paul McCartney DNA sprinkled on top, with three fairly distinct parts, it’s a pure pop winner. Great stuff. Phyllis Johnson | “30 Trips Around the Sun” Gee whiz, Phyllis Johnson…when are you going to make the album that’s sure to blaze around the sun and swoop up a grand, adoring, worldwide audience for your beautiful music? Here is Phyllis’ latest modern classic, a delicious channeling of Aimee Mann-esque mid-tempo balladry that hooks you upon first listen. Lovely. Dion and Paul Simon | “New York is My Home” Who doesn’t stop in his or her tracks to soak in a new song from the great musical poet of New York, whose streets resonate with his legacy? Dion’s new song, sung with another Big Apple poet, Paul Simon, is a gorgeous, soulful love letter to the city that remains a most vibrant, shining star. Terrific. Kenny Herbert | “Forever and Beyond,” “You,” and “It’s a Wonderful Life” We continue to swoon to the sounds of one of our favorite singer-songwriters, who we’ve been playing on the air for quite a long while. Kenny’s new album, Forever and Beyond, is set for April release and we can’t wait. We’ve got a trio of love songs for you, in advance of the release–the title track, arranged for acoustic guitar and understated orchestration, and a beautifully sung charmer; the oh-so-pretty “You”; and “It’s a Wonderful Life,” a love letter to Frank Capra’s classic film that also points to having a wonderful life in the here and now. We can’t wait for the full album. Kyle Vincent | “Narita (Tokyo Girl)” and “Whatever Happened to Fun” Here’s a real springtime treat, slightly in advance of the season. “Narita (Tokyo Girl)” is a wonderfully catchy, upbeat pop song with a great, catchy melody; “Whatever Happened to Fun” is a fun, new recording of the classic song released by Kyle’s former band, Candy, in 1985. It’s always great to have new Kyle Vincent songs to play on the radio. Linda Perhacs – “The Dancer” This intoxicating, atmospheric number, co-produced by Fernando Perdomo and Wilco’s Pat Sansone, is alive and vital; it will presumably be included on the artist’s next album, only her third since 1970. You won’t be able to get this song out of your head. Gorgeous. The April Family | “1943” Michael Carpenter, Casey Atkins and Kylie Whitney, whose 2014 album, Something About Ghosts, was one of our favorite records of that year, come together to deliver a swampy, soulful (there’s that word again) track that bubbles with emotion and fury. Factor in the amazing Kylie vocal and you’ve got a track that makes you want to hear more. Superb. Tom Shaner | I Hate to See Your Spirit Fade Perhaps more on the folk and blues sides of life’s musical equation than pop, Tom Shaner’s songs exude a certain seductive energy that is all in there, emotionally speaking. A protege of Jeff Buckley, Tom logged time in New York City band Industrial Tepee. We’re playing seven great songs from this superb album, including “New York City is Paradise #2,” “Tide of Love” “Vanessa the Vegan Murderess,” “Your Complication Soul,” “When the Devil Comes Callin’,” “I Can’t Be the One,” and “Wandering Heart.” A beautiful, soulful record. Velasco | “I Can’t Surf” Decidedly sitting on the pop side of the musical fence, this singer-songwriter out of Paris (the one in France) follows up his two EPs and four singles with a sweet-sounding, upbeat, catchy song set to a relaxed surf beat. Love, love, love it. Welcome Giuseppe Velasco to Pure Pop Radio. There you go: just some of the latest adds to the Pure Pop Radio playlist. And, as usual, we’re just getting started! Be with us next week for more runs through some of the latest songs and artists we’ve started playing in rotation. Until then, why not click on one of the listen links below and tune into the greatest melodic pop music in the universe! Yes, the Rumors are True: We’ve Got Another CD Up for Grabs, and the Winner Could Be You! Hey! 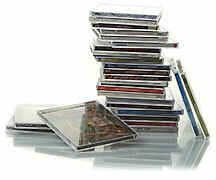 It’s Pure Pop Radio’s pile of CDs! See, the way it works is we’ve got this pile of CDs and every time we look at that pile, we’ve got to give one of those CDs away. And so we shall. Up for grabs this rainy Tuesday morning is the latest album from one of Pure Pop Radio’s favorite melodic pop collectives, a group from Sweden that mixes their love for the music of Jeff Lynne and the Electric Light Orchestra with a mastery of contemporary, hook-laden tunes. How’s Life on Earth? 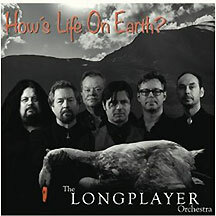 is the Longplayer Orchestra’s second album, released last November. You can sample a few of the songs from this spectacular album by clicking on the links below. 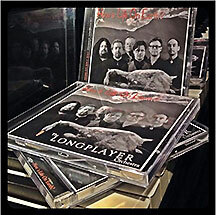 It’s a whole lot of the Longplayer Orchestra! We would love to send a copy of How’s Life on Earth? straight to your mailbox, but you’ve got to be in it to win it. 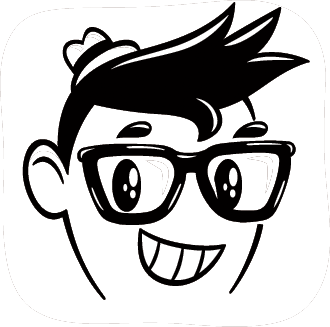 Simply fill in the form below and make sure to type “Excellent!” in the Comment field. Contest ends this coming Sunday, April 20, at midnight. Enter only once. Have fun and good luck!